1) Why is it called Saddle-Stitching? 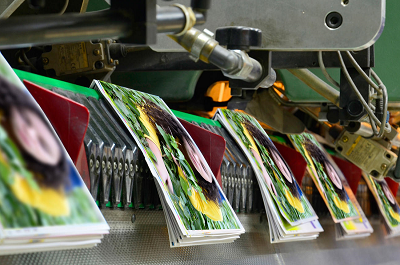 Saddle-Stitching may sound like an odd name for a book binding process that places wire staples through sheets of paper, but in the printing industry Stapling is commonly referred to as Stitching. Also, the collated sheets are draped over a Saddle-like apparatus during the stapling/stitching process…hence the name Saddle-Stitching. 2) How is a Saddle-Stitched book constructed? To illustrate the construction process, let’s use a Saddle-Stitched booklet with a finished size of 8.5″ x 11″ as an example. The pages and cover of this booklet would be made from 11″ x 17″ sheets that are folded in half to 8.5″ x 11″. The folded sheets would be nested one inside the other and then stapled together along the folded crease. This folded crease forms the book’s spine. Each 11″ x 17″ sheet folded in half creates four pages of the book. Once the 11” x 17” pages and cover have been printed, partially folded, and nested together, they are joined together by the staples. Then the pages and cover are folded tighter together to compact the book. As a final step, the open edges are trimmed as needed to keep the pages uniform and neat in appearance. In most cases, the cover of a saddle-stitched book is created from a different paper stock than the interior pages. The cover is often heavier, glossier, or a different texture than the interior pages. Sometimes, the cover of the book is made from the exact same paper as the pages. In this instance the book is referred to as a “self-cover” book. 3) What is the minimum number of pages that can be Saddle-Stitched? By its nature, Saddle-Stitching requires the book’s page count to be in multiples of four. This means the minimum book size is either an 8-page self-cover book or a 4-page + cover book… both of which are created from two folded sheets nested together. 4) What is the maximum number of pages that can be Saddle-Stitched? The maximum number of pages is largely dependent upon the thickness of the paper used to create the book. This is because the staples can only accommodate so many sheets of a given thickness. Too much bulk and a saddle-stitch book will not lie flat…it will be inclined to “spring open.” This is especially true for books of a small physical size. As a general rule, 64 pages or less will normally produce a nice flat booklet. If the paper used for the pages is very thin, saddle-stitched booklets can be made with 100 pages or so. 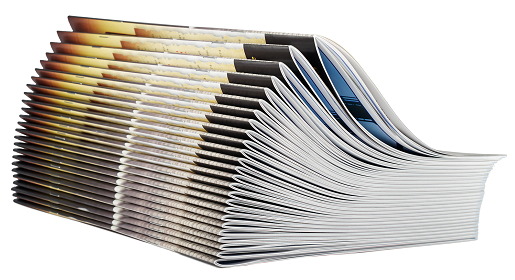 Once the page count of a booklet goes beyond the limit of what the saddle-stitch method can accommodate, the Perfect Binding and Coil Binding methods are recommended. 5) Can a Saddle-Stitched book have printing on its spine? No. The spine of a traditional Saddle-Stitched book cannot be printed upon because it is not a flat surface. 6) How many wire staples are used with the Saddle-Stitch Binding method? 99% of the time, two staples are used to secure the cover and pages. Very large books may require more staples along the spine. Very small books, such as those with a spine length of around 2” or less, are often made with just one staple. 7) Can Saddle-Stitching be used for books with very small or very large dimensions? Saddle-stitching works well with almost all book dimensions, including mini-books and oversized books. The Saddle-Stitch method also works well with any book orientation…Portrait, Landscape, or Square. 8) Is Saddle-Stitching the least expensive book binding method? Yes. Saddle-Stitching is the least expensive method for creating books and other bound documents. Despite its low cost and relative simplicity, the Saddle-Stitch method produces a very professional looking document. 9) What types of books are Saddle-Stitched? Books that are commonly saddle-stitched include catalogs, manuals, booklets, programs, directories, multi-page brochures, price and part lists, newsletters, comic books, coloring books, magazines, wall calendars, and mailers. 10) What are the main benefits of the Saddle-Stitch method? It is the least expensive binding method. The turn-around time is generally quite fast. It can be used for short or long production runs. This method works very well for lower page counts. It allows for books to be made in a wide range of sizes – small like a pocket guide or large like a road atlas. Books can be hole-punched along the spine for insertion into a ringed binder. Relatively easy to design and can accommodate artwork or images that span two adjacent pages (crossover images). Adds minimal bulk or weight to the printing, so it is especially good for pieces that will be mailed. If you have any questions about Saddle-Stitching, or have any other book binding or printing questions, just give Formax a call at 866-367-6221. Or, if you already know your specs and would like a quote for an upcoming project, click here to access our easy quote request form. We’ve been printing books for over 30 years and look forward to assisting with your next book project!